ClipAutoUpdate is a free Avid Deko utility that monitors a specified clip folder on the E drive for new clips that are added to the folder and automatically transcodes any new clips added to the folder to use in Deko and imports the clips automatically to the designated clips database. ClipAutoUpdate.exe is an executable program and is located in the C:\Dekoxxxx\Utilities folder. For ClipAutoUpdate to operate it must be launched and configured to actively watch a folder for any changes to the folder. If it is launched after files have already been added to the folder, it will not import those already existing files. Deko supports two types of clip databases: Standard clips and Power Clips. Standard clips are full screen, or full resolution, clips. Power Clips (Deko3000 only) are smaller-sized clips, such as ‘moving headshots.’ Power Clips are contained in a database separate from the Standard clip database (Select View > Clip Editor > Context > Type. Both types of databases can be monitored with ClipAutoUpdate. 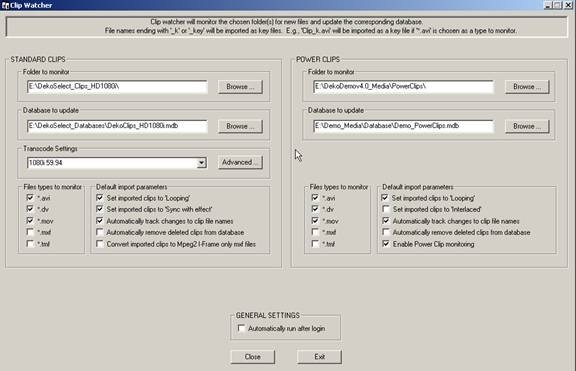 AutoClipWatch can be configured to watch separate folders for Standard Clips and Power Clips (both must be housed on the E drive) and will update separate databases with changes to each of the folders. It can also be configured to monitor for additions of specific file formats (i.e. *.dv, *.mov, etc.) and import to the appropriate database only if these file formats are encountered. Power Clips Note: PowerClips retain the *.mov file format and are not transcoded into *.mxf files. ClipAutoUpdate automatically adds a clip to the Deko clip database using the filename’s base as the database item name. Since Deko uses separate files for video fill and video key, a suffix is added to the basename as ‘_v’ for video fill and as ‘_k’ for key (i.e. matte, fill). For example, a blue.mov file that has an embedded key will import into Deko as blue_v.mxf and blue_k.mxf. Note: Since ClipAutoUpdate uses the base filename for the database entry, two clips with the same name cannot be inserted into the database (i.e. Filename.dv and Filename.mov do not import as two distinct files). I’m an Avid certified instructor for the On-Air Graphics products: Deko, DekoCast and Thunder and related products such as DekoSelect, ThunderSelect and Command. I became affiliated with Avid through Pinnacle Systems, initially in the late 90’s as a user of Pinnacle’s On-Air graphics technology and following this as a freelance instructor for Deko, Thunder and Dekocast. I joined Pinnacle in 2004 as a staff trainer and curriculum developer for on-air products and continue to enjoy this role since the acquisition of Pinnacle Systems by Avid. My formal education includes a journalism degree at the University of Houston and a Masters of Business Administration specializing in advertising from University of Texas. My real education is in front of a keyboard and in front of students, teaching and learning with them. Working with Avid, I walk into a range of environments from universities to networks to military sites and work with a range of professionals using Avid on-air-graphics products to tell their stories.